The Lackawanna Avenue Commercial Historic District, the historic commercial core of Scranton, is composed of a three-and-one-half block section of Lackawanna Avenue and one square block which adjoins the Avenue on the northeast. 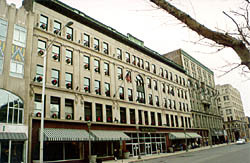 The buildings along Lackawanna Avenue are generally three or four stories in height, containing a variety of materials including brick, stone, tile, and stucco. The most substantial buildings in the district are located along Wyoming and North Washington Streets. Built in the late 19th and early 20th centuries, these buildings reflect a greater adherence to distinct architectural styles than their counterparts on Lackawanna. The most common styles are Renaissance Revival, Richardson Romanesque, Neo Classical and an early example of Art Deco. In the late 19th century Scranton became the heart of the anthracite coal mining industry in Pennsylvania as well as a manufacturing center. With a population of almost 150,000 in 1930, Scranton's growth between 1860 and 1930 had been remarkable. During those years of growth Lackawanna Avenue served as the commercial center of Scranton. Featuring a number of fine examples of late 19th-century architecture, the Avenue characterized the prosperity and hopes of the city. By the 20th century the business district had expanded beyond Lackawanna Avenue to include a one block section of Wyoming and North Washington Streets. The extension of the district was enhanced by the recently constructed county government facilities situated two blocks east of Lackawanna. America's first all electric street car system, with numerous stops on Lackawanna, added to the ambiance. New retail establishments and a large hotel, the Casey Hotel, opened along the Avenue. The new buildings were commonly Richardson Romanesque, Neo-Classical and Renaissance Revival in style. Some Art Deco architecture was also introduced in the extension during the 1920s. While commercial activities in Scranton slowed in the 1920s, the city's "Golden Years" ended in 1929 with the onset of the Depression. Although the district fell on hard economic times, Lackawanna Avenue still reflects the prominence that was a part of Scranton in the late 19th and early 20th centuries. 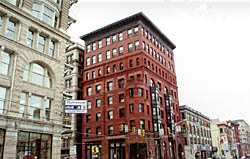 The Brooks Building, located at 436 Spruce Street, is an eight-story red sandstone and brick office building erected in 1891 as the Commonwealth Building. Designed by L. C. Holden, the building later became the Peoples National Bank from 1906 to 1917, and later housed the J. H. Brooks brokerage firm for many years, which gave the building its name. The Lackawanna Avenue Commercial Historic District is located on the 200-500 blocks of Lackawanna Ave., the 100 block of Wyoming & Washington Aves., and the 400 block of Spruce. Many of the businesses within the district open to the public during normal business hours. .